The foods of a region engages all of the human senses… sight, sound, smell, touch and taste, and Olympic Peninsula dining is no different. Fresh local ingredients harvested from the land and waters, and made locally, impart a sense of place, and a feel for the local culture. Every culinary experience, whether it takes place in a restaurant, at a roadside food stand, at a local a winery, or in a private home – is an opportunity to discover the region’s bounty and immerse yourself in the quality of life of that place. This beautiful area of Washington is resplendent with fresh, organically grown fruits, vegetable and berries, as well as coastal seafood, hand-crafted locally made wines and other food products. 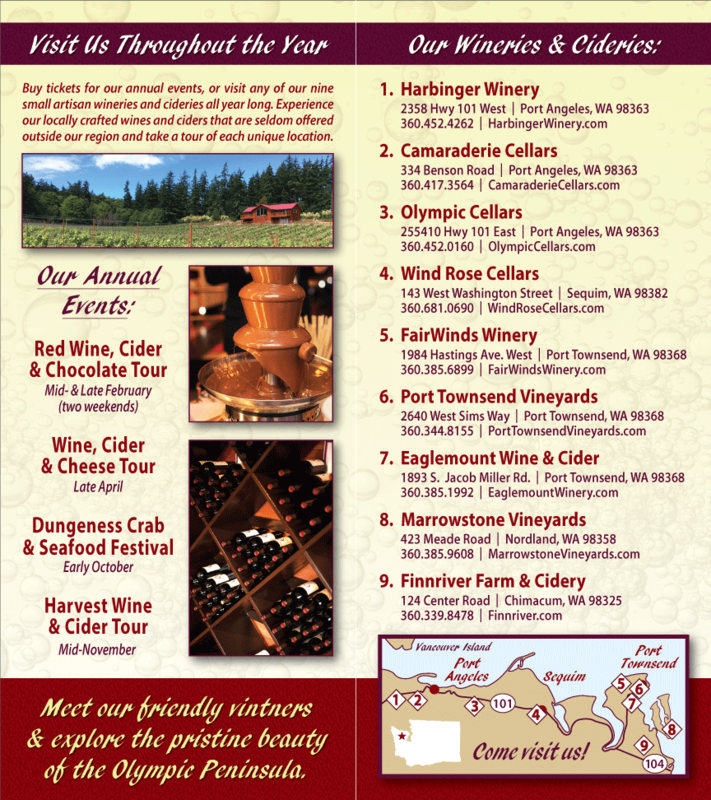 The Olympic Peninsula has much to offer the wine tourist. Locals are proud of this scenic region’s longstanding agricultural heritage, and the farmers, restaurants, hotels, and winemakers that have perpetuated a successful “eat local” movement. Visit the Farmers Markets, roadside stands and local farms. Pick berries, eat fresh local crab, wander through fields of flowers, sip locally made wines, and enjoy a leisurely picnic in a stunning location…Welcome to the Olympic Peninsula of Washington and fabulous Olympic Peninsula Dining! Sunny Farms Country Store, Sequim. 261461 Highway 101 West. Open year ’round, 8 am-7 pm. Country Aire, 117 East First St., Port Angeles. Open Monday­-Saturday, 9 am-6 pm; Sunday, 11 am-4 pm. The Dungeness Valley Creamery, Dungeness. 1915 Towne Rd. Open year ’round, Monday-Saturday, 10 am-5 pm. Family Farm, 3931 Old Olympic Hwy. Monday-Saturday, 8 am-5 pm. June to first week in October. Gertie’s Farmers Market, Port Angeles. One block east of Race St. on First. March-December, Saturdays, 9 am-3 pm. Good to Go Grocery, Port Angeles. 1105 S. Eunice St., 2 blocks west of Race and Lauridsen Blvd. Open year ’round, Monday-­Friday, 8 am-6 pm; Saturday, 10 am-5 pm. Johnston Farms, 1046 Heuhslein, off Old Olympic Hwy., Port Angeles. Monday-Friday, 10 am-6 pm, June to October. Nash’s Farm Store, Dungeness. 1873 East Anderson Rd. Open year round, Tuesday-Sunday, 10:00 a.m. to 5:00 p.m. Port Angeles Farmers Market. County Courthouse parking lot, 4th and Peabody Sts., Saturdays, 10 am- 2 pm, year ’round, weather permitting. June-September, Wednesdays, 3 pm-6:30 pm, downtown, off Laurel St. Port Townsend Farmers Market, Tyler St. at Lawrence, Saturdays, 9:30 am-l:30 pm; Polk St. at Lawrence, Wednesdays, 3:30-6:30 pm from June to October. The Port Townsend Food Co-op. 414 Kearney St., Port Townsend. Open year ’round. www.foodcoop.coop. Chimacum Corner Store, 9122 Rhody Drive, Chimacum. Open daily from 9am – 7pm. Finnriver Farmstand & U-Pick, 62 Barn Swallow Rd., Chimacum. Open seasonally. Red Dog Farm, 406 Center Rd., Chimacum. Open 8am – 8pm. Colinwood Farmstead, 1210 F Street, Port Townsend. Open 24 hours, cash only, honor system. This is a partial list of local farms where you can find excellent produce, meats, eggs, dairy and other farm items. For a more extensive list, please see the Friends of the Fields website at www.friendsofthefields.org. Bekkavar Family Farms, 273054 Hwy. 101, Sequim. Beef. 683-3655. Cameron Berry Farm. Woodcock and Wheeler Rds., Sequim. U-pick strawberries. 683-5483. Creek Road Cottage Farm, 483 Siebert Creek Rd., Port Angeles. Apples. 417-0605. Dungeness Meadow Farm. 135 Meadowmeer Lane, Sequim. Organic blueberries. 582-1128. Dungeness Valley Creamery. 1915 Towne Rd., Sequim. Raw milk. 683-0716. Elwha Apiary. 539 Herrick Rd., Port Angeles. Local honey and garlic. 452-9358. Graysmarsh Farms. 6187 Woodcock Rd., Sequim. Berries for U-pick and purchase. 683-0624. Hole-in·the·Fence Farm. Port Angeles. Lamb and multon, poultry, eggs. 457-3627. Ireland Farms. 20 Spath Rd., Sequim. Grass-fed beef, eggs, pears and pasture mushrooms. 683-8399. Johnston Farms, 1046 Huehslein Rd., Port Angeles. Fruits and vegetables. 452-1936. Kol Simcha Farm. 3284 Happy Valley Rd., Sequim. Lamb, garden produce in season. 775-0424. Laurel Ann’s Rainbow Farm. 142 Towne Rd., Sequim. Berries and vegetables. 683-6068. Lazy J Tree Farm. 225 Gehrke Rd., Port Angeles. Apples, cider, Asian pears, potatoes, assorted vegetables in season. 457-5950. Ninna’s Barn. 340 Frost Rd., Sequim. Grass-fed lamb, eggs. 681·6306. Nouveau Farm, 813 Youngquist Rd., Sequim. Organic salad greens, herb mix, vegetables. 681-2486. Olympic Wilderness Apiary. 46492 Hwy. 112, Port Angeles. Honey. 928-3125. Rick’s Organic Produce. 310 Cameron Rd., Sequim. Organic vegetables. Salt Creek Farm. 310 Sail Creek Rd., Port Angeles. Organic fruits and vegetables. 928-3583. Sunset Berry Farm. 632 Alterberry Rd., Sequim. Organic berries. 683-7651. WestWlnd Farm on Sail Creek. 585 Wasankari Rd., Port Angeles. Vegetables and fruits. 928-3022. Winters Farming. 722 Deer Park Rd., Port Angeles. Beef and lamb. 452-2731.